Before the wheat leaf sheaths become erect after spring green-up, the developing growing point, which is below the soil surface, will soon begin to form a tiny head. Although the head is quite small at this point, it has already established some important yield components. At this stage, the maximum potential number of spikelets is determined. Sufficient nitrogen (N) should already be available in the root zone at this growth stage to maximize the potential number of seeds per head. To look for FHS, start by digging up some plants from fields or areas that have not been grazed, such as field corners or just outside the fence. Date of FHS is variety- and field-specific, so it is important to sample each individual field. Select the largest tillers to examine, and slice the stem open from the crown area up. Look for the developing head, which will be very small. Next, see if you can find any hollow stem between the developing head and the crown area. If there is any separation between the growing point and crown, the hollow stem is elongating. If that separation is 1.5 cm, the wheat plant is at FHS. FHS occurs between a few days to a week or more prior to jointing, depending on temperatures. Crop development is mostly a function of available water, nutrients, and temperature. While nutrient availability is field-specific and water has been abundant since the fall for the majority of the wheat growing region of the state, temperatures will be the focus of this discussion. 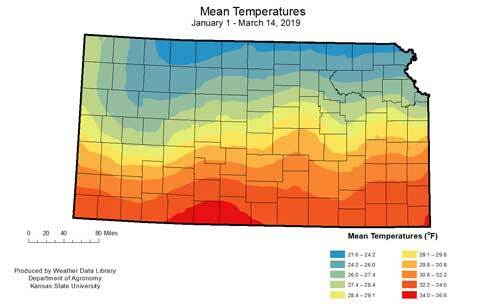 Average temperatures across the entire state of Kansas were cooler-than-normal for the time period between January 1 and March 14 (Figure 3), which will likely delay the arrival of first hollow stem as compared to most years. As temperatures increase and wheat begins growing more rapidly in the spring, producers should start thinking about when to pull cattle off pasture to protect grain yields. Figure 3. 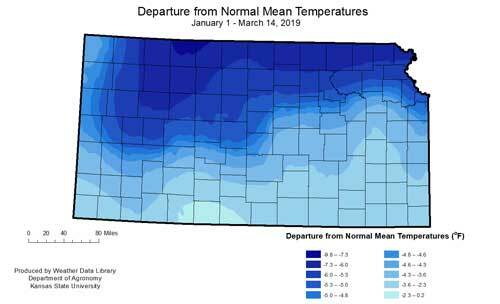 Mean and departure from long-term average temperatures during the period of January 1 to March 14, 2019. Maps generated by the K-State Weather Data Library. Figure 4. 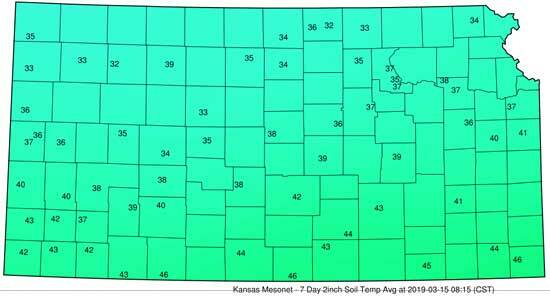 Weekly average soil temperatures at the 2-inch depth during the period March 9 – March 15. Map generated by the K-State Weather Data Library. Soil temperatures will be slow to warm as much of the state has very saturated soils. As the soils thaw, muddy conditions may also influence the decision to remove cattle. For more information on managing wheat in dual-purpose systems, check the K-State Research and Extension publication MF3375 [PSS-2178 from Oklahoma State Extension], “Dual-purpose wheat: Management for forage and grain production” at https://www.bookstore.ksre.k-state.edu/pubs/MF3375.pdf.